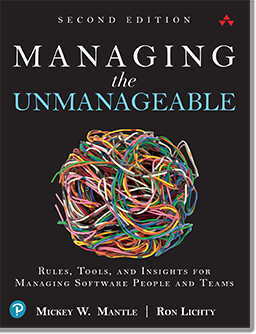 We list here the tools referenced in the chapters of our book, Managing the Unmanageable: Rules, Tools, and Insights for Managing Software People and Teams. 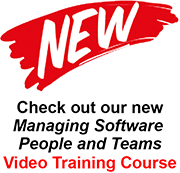 We have developed or collected these tools over many years, and have used them effectively in our own work to help manage programmers, programming teams, departments, and organizations. We encourage you to personalize the tools and adapt them for your own needs and environments. These tools are provided “as is” and the authors make no representations as to their accuracy, completeness, or validity. The tools—Excel workbooks (one or more worksheets) and Word files—are organized by the chapter with which each is associated. Several (highlighted below) may be downloaded and used by anyone interested in sampling this valuable resource. The full set, however, may be downloaded and used only if you have purchased a copy of the book or access to the video course. Go to the Tools-downloads page and have your copy of book or slides handy—you’ll need it to access the files. 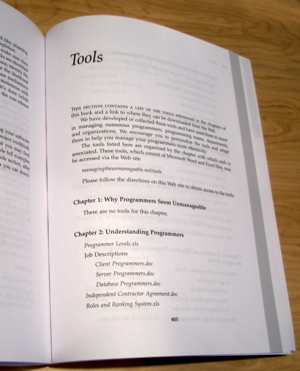 There are no tools for this chapter. How many days before you leverage our rules, tools and insights to manage your unmanageable?